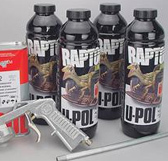 U-POL is dedicated to manufacturing and selling automotive refinish products including bodyfillers, coatings, aerosols, adhesive, wipes, polishing compounds and consumables of the highest quality. The company exports over 65% of its products to more than 80 countries worldwide under the U-POL, System 20 and MAXIMUM brands amongst many others. U-POL is committed to providing customers with products of the highest quality and has invested considerable resources in both its research and development and operations process. With the company’s very own manufacturing plant in the UK, U-POL is now recognized as having one of the most modern paint plants that produces large volumes of automotive refinish products, in Europe.